Rehabilitation of the Osborne Street Bridge began in April 2011. The project includes road resurfacing/reconstruction on Osborne Street from Roslyn Road to a point just north of the Broadway/Osborne intersection. Click on the image at right to see a rendering of the new deck configuration. Motorists, cyclists and pedestrians are now fully able to cross the Assiniboine River between Osborne Village and the city's downtown via a newly refurbished Osborne Street Bridge, which was built in 1882 and reconstructed in 1977. This refurbishment project has extended the service life of the structure by 75 years. Final traffic diversions will occur on the Osborne Street bridge this upcoming weekend between 7:00 pm on Friday, October 19, 2012 to 6:00 am on Monday, October 22, 2012. One lane in each direction will be maintained during this period. The diversion is required for bridge construction works. Shortly afterwards all five lanes (three southbound and two northbound) of the bridge will be opened. The project is still on target for completion in late October 2012. The City of Winnipeg thanks all users for their patience and understanding during the construction period. Osborne Street traffic will be diverted to the west side of the bridge over the Thanksgiving Weekend between 7:00 pm on Friday, October 5, 2012 to 6:00 am on Tuesday, October 9, 2012. One lane in each direction will be maintained during this period. The diversion is required for bridge construction works. The bridge rehabilitation project is progressing well and is nearing another milestone. On Monday, September 3, 2012, southbound traffic will be routed to the west side of the bridge. At that time there will be two northbound lanes on the east side of the bridge and two southbound lanes on the west side of the bridge. Work will commence in the median portion of the bridge. The west sidewalk will remain closed and pedestrian traffic will be accommodated on the east sidewalk. The road works on Osborne Street north of Granite Way including work in the Broadway intersection is complete. Work is progressing well on bridge rehabilitation and roadworks on Osborne south of the bridge and are on target for completion by October 2012. Due to exceptionally good weather and an early start to the construction season this year, the roadwork rehabilitation on Osborne Street north of Granite Way (formerly Mostyn Street) will commence Monday, April 23, 2012 and is set to be completed before the end of June, 2012. 2012. Originally, roadwork rehabilitation north of Granite Way was to occur later this construction season. On Saturday, April 21, 2012, the closure of the west curb lanes on Osborne Street will be extended north of Broadway to permit roadwork rehabilitation in that area to be performed. As well, the west sidewalk on Osborne Street from Broadway to the bridge will be closed as that sidewalk will be renewed. 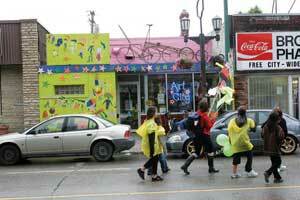 After June 17, those portions of lanes on Osborne Street will be reopened. 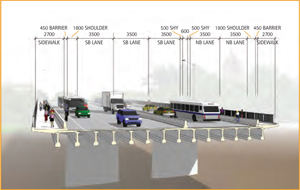 Updated diagrams showing vehicular, cyclist and pedestrian traffic flows during this phase of construction is shown in the Traffic Management Plan. The City of Winnipeg thanks all Osborne Bridge users for their patience and understanding while we renew and improve this critical piece of infrastructure in our city. The Osborne Bridge renewal project is scheduled for completion in late October, 2012. Work will continue on the rehabilitation of the Osborne Street Bridge. Over the weekend of March 30, the western portion of the bridge including the west sidewalk will be closed to traffic and three lanes (one lane in each direction and a switchover lane to accommodate peak traffic) and the east sidewalk will be open on the eastern portion of the bridge. The work also includes road rehabilitation on Osborne from River Avenue to Broadway. Pedestrian traffic on the bridge will be restricted to the east sidewalk. At the north end of the bridge the under-bridge path connecting the east and west sidewalks on Osborne will be open, if river levels do not flood out the pathway, to permit pedestrian and cyclist traffic to safely cross Osborne Street. If the underbridge path is not open pedestrian and cyclists will have to use the crossing at Broadway and are strongly cautioned that jaywalking to cross Osborne is unsafe. At the completion of the project an at-grade signalized pedestrian and cyclist crossing just north of the bridge will be provided. In late summer when rehabilitation of the western portion of the bridge is complete traffic will be shifted to 2 lanes each direction and work will commence in the center of the bridge to complete the concrete median barrier that separates northbound and southbound traffic. 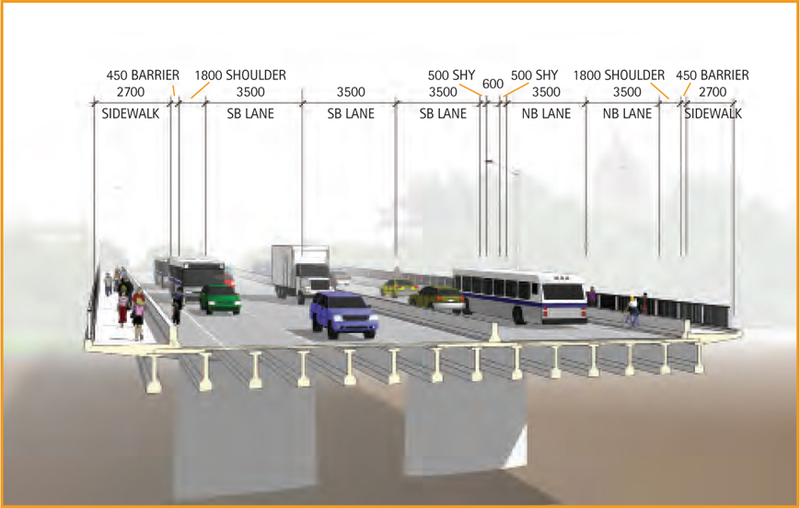 Vehicular, cyclist and pedestrian traffic flows during this phase of construction is shown in the updated Phase 2 Traffic Management Plan. All work is scheduled for completion in late October 2012. Why does the bridge have to be rehabilitated? Over the years, extensive repairs have been done to the bridge's concrete deck, sidewalks and median, due to high traffic and corrosion of reinforcing steel from de-icing salts. The median deck overhangs are substantially corroded. They have required regular patching and removal of loose and deteriorated concrete. These repairs are no longer effective at preserving the bridge and a long term solution was needed. The work on the bridge is a major rehabilitation and will extend the lifespan of the bridge by up to 75 years with routine maintenance and periodic renewal. Prior to the start of detailed design, a public consultation and a collaborative planning process were completed to determine the needs of the bridge users, residents, businesses, and other project stakeholders. A Neighbourhood Advisory Committee (NAC) was formed to help identify the project goals and objectives. The NAC included representatives from local residents and businesses, the local BIZ groups, community groups, business groups, and some major employers near the bridge. Working with the project consultant team, the NAC made specific recommendations to the City of Winnipeg on issues like the bridge deck configuration and bridge aesthetics. The City of Winnipeg is partnering with the Winnipeg Arts Council to incorporate public art into the bridge. A team of artists was hired to work side-by-side with the engineers and landscape architects on the design team to provide a bridge that truly fits with the two very distinct neighbourhoods on the north and south side of the Assiniboine River. Special handrails with accent lighting together with a patterned sidewalk on the bridge will celebrate local neighbourhood history, locations, events, and other local heritage elements. For further information contact 311.